One of the most visible contemporary Tibetan artists, and clearly a doer, Tashi Norbu has achieved what many could only hope for. As a validation of his artistic accomplishments and hard work, the city of Emmen in the Netherlands has realised an art museum for him. The new museum is yet to be officially inaugurated, but has had more than 5,000 visitors in less than two months. His assistant at the Museum said people are thrilled to look at Tashi's art works, and narrated one instance in which a young child asked if one of the pieces was a depiction of a dream. The child remained standing in front of the painting for a long time. Tashi is a trained Thangka painter, and also studied contemporary western art in Belgium after he moved there in 2000. He moved to the Netherlands in 2007 and started his own art studio, "9 Pillars", in Wormer, a village close to Amsterdam, in 2010. Tibet is not necessarily seen as a part of his works, but the feeling of Tibet resonates in them. This is amply evident when visitors start talking about Tibet, the Dalai Lama, and Buddhism, as witnessed by this reporter when he interviewed Tashi at his museum on 24 July when he was recently in The Netherlands. Tashi feels that more traditional 'believers' might not appreciate his artwork nor the modern icons that are part of it. He has chosen the image of the Buddha as his theme. But his paintings of Buddha are not done in the traditional method of drawing, with exact measurements, and hence they may not be seen as 'serious enough'. But for Tashi it's his way of doing things -- a new way of promoting peace and happiness, speaking a new language -- art. Q. Tashi Norbu la, you have a very beautiful exhibition here in Emmen, at the Museum of Contemporary Tibetan Art. In fact I see a lot of paintings that you have done, and there are also a few installations such as the Buddha and the other one, with so many materials. And they are very beautiful. How did this all come about, how did this happen, in Emmen? Q. Actually Holland is not very big -- in a few hours drive you can make a round of the country. It's two hours from Amsterdam, and this place is like five minutes from Germany, you're on the border. Even to the north, like Scandinavia, is closer. So I see the exhibition more like covering all of Europe. For about four years I'd been looking for such a space. In Amsterdam, it's getting very busy there, and I'd become more like a manager of my art. I wanted to have a space more peaceful, and more space that I can find if you go a little bit far out from the city. That kind of idea -- everybody longs for such. So this is something like a dream come true for me. It was a lot of work for me, but still, I manage to do a lot of work now, and the rest is done by my partners here. Marianne Tolen, she's the main, with her whole team. Actually it's not just a one-man thing — we have like 10 or 12 people working for this. And finally I am resting and making artwork for this 11 to 5, which is a great kind of healing for myself. So how did it come, why I would do this -- since many years, I've been making art works the way I wanted, like big installations, big canvases, five, 11 metres even -- those are like 20 feet or something? I've never really worried about where does my art go. I always did the moment, the moment which I wanted, I find it, that's it. So that's how it came to be realised. Q. To have a space like this is really amazing for an artist. Is there any support from the city, for example from Emmen, or organisations -- because this is going to cost a lot of money as well. Also like you said, you have a dozen people working with you, a lot of costs. How do you manage all this, and the facilities, where are you getting these facilities from? A. In fact yes, we're working on the whole subsidies. Mainly it's your own initiative. Of course, there's the Tibetan government, but there's nothing much they can do about creating such a space, or even having such a concept. I think this is a bit less in their knowledge. This whole thing, we Tibetan contemporary artists have been spending our life to understand and realise this in our culture. So funding the whole thing, is like basically you start by yourself, me and my partner, and then we try to make this whole thing. And then of course, it became so wonderful, that the city of Emmen even liked it so much, the whole thing, because they didn't have a contemporary art museum, and on top of it, showing Tibetan culture, contemporary art. And I do have a few collections of other Tibetan artists, so I am showing them also. Which many Tibetans have seen for many years -- since 2009 I've been doing those shows, 12 times, in different places. So this is like my wish to show it, because I have an opportunity. Of course everyone has it, but I just grabbed the opportunity and made it happen. And the city thinks this is perfect, they're 100% with us, supporting. So it becomes a kind of a pyramid, moving in one direction with a great foundation. Q. In your paintings, from all the ideas, the designs, the possibilities, and the potential that we have in Tibetan culture and society, your theme is mostly around the Buddha. Is there any particular reason for that? A. Yeah. I'm actually always trying to see, transform our culture, into a new culture that we would be interested to preserve. Already a lot of monks, tulkus, rinpoches, are leaving the monasteries. This is reality. In Nepal and all this, they have to shift each other around so they have some monks [in the monasteries]. So in that context, creating Buddha's figure is not bad. And in this form, I'm taking the image of a Buddha, and I'm filling it up with the new culture, the pop culture, whatever we are into now. So I am trying to enrich the culture, so we can appreciate it in the future. Right now, every young Tibetan likes this very much, unlike thangka paintings. I have studied thangka painting myself seven years in Dharamshala, and I'm totally in favour of that. You can see very clearly that all my lines are based on thangka painting. At the Library [Library of Tibetan Works and Archives], you have this menri style of painting from Menla Dhondup. So I've studied thoroughly, but during that time I already wanted to make some new thoughts about it, and I had some discussions with him. (He died now, everybody knows it.) And he already saw those, and he said, you can become a new Tibetan contemporary artist, make a new form. Because Menla Dhondup is the one who founded the Tibetan thangka painting. He is from Lhoka, my province in Tibet. So these are nice memories of my teacher. And so I'm very aware of my culture, the artistic culture of thangka painting. I'm not breaking the rules. There's a saying if you want to break the rules you have to know the rules. So this is what I'm seeing. I know my movements, how I'm moving through these lines, these rules, the iconographic measurements, I know it. That's how I have studied it, in Dharamshala painting. A story -- after high school, everybody goes to college, and me, I go to study thangka painting. I felt so stupid, my friends would call me from Chandigarh, "hey, what are you doing? that's what a stupid Tibetan does." They think that, you know. So now, after many years, some of them have become engineers, computer, whatever, and they say "Oh Tashi, you did the best move." So I am very happy. So I moved from the traditional to the modern culture. In Europe I went to study Western art thoroughly, and now I'm trying to make it artistic culture, unify the both, in our form, so we can communicate with the new generation of Tibetans especially. Of course the Western people, they are so well-educated. Young kids, you saw the museum, how the space is. It's ongoing, people come in ... even the kids, the white kids, they just got thrilled. Whereas I realise, if you tell the Tibetan kids to go in, they will be like, what, they will not go in, it's not exiciting for them. So there's such a big difference. So I'm seeing in a broader sense, seeing into the future. 100, 200 years later, I'm trying to visualise it. Q. You have studied thangka painting for a very long time in India, and then you have studied the Western art. How do you see the art life, the importance or the value of art within Tibetan society, apart from thangka painting -- there are so many organisational and individual initiatives to promote thangka painting, but how do you see art in a general context in Tibetan society? A. I think Tibetan society does not realise they are moving on. For example, what they are wearing is jeans and t-shirts, right? -- that's completely Western culture. They don't hang out with chupas [traditional Tibetan robe]. But they don't realise there's a culture behind these jeans and t-shirts. It's a kind of a bardo, you know. Artists, writers, poets -- or your Miss Tibet Pageant -- these concepts, the culture behind these "jeans", in that sense, they don't realise. The artists, the writers, we're trying to show them this is the culture, these new things, which we have to realise, we have to study about it, so then you know what you're doing. If you just blindly go, then it's just [Tibetan], you don't realise what you're doing. I think this Western kind of culture, the European culture, they have a deeper value in it. For example, let's talk about Western women. It may sound stupid to say, but it's very serious stuff: We think Western women are very easy, like that. But we don't realise they have worked for centuries so hard for the concept of feminism, they have sacrificed their life for this, for women's rights. And now they are practising it, they are living the feminist, women's rights. Which we don't have, we have zero in it, in Tibetan society. So that's the artistic way of looking at it, that's what I see. Just being a contemporary artist means being yourself, being in the present moment, so if you can live fully that moment, I think you're enjoying the present, you're enjoying what you're doing. In fact it's a very Buddhist viewpoint. You don't call it visionary or something ... Tibetan lamas, we think they are visionaries, one who sees the future or something. Which is good, there are some stories. But I think in Tibetan society we need to have more logic, in the Buddhist schools we should study how to be logical, to train the layperson or monks to be more practical, more logistic. Not only my art, I'm talking about writers, poets, any form of art which makes the viewer's brain to think, makes it move, I think that's the value of art. Q. I know you are creating, developing your own art form, with traditional Tibetan thangka painting as the base. And then you use that line to do other things. So that is your form. And all the time I see the Buddha in your paintings and installations. Could you explain that further, that is one question. And two -- having studied Western art also, who among Western artists do you enjoy, and appreciate, and feel that you want to follow? A. First of all, why I am creating a lot of Buddha images. Earlier, my reference to the Tibetan people -- when I draw something Buddha, they can recognise this image and they see how it is transforming -- or in some sense they would see it as manipulating [laughs]. I would also see it as, we Tibetans, when we come to the West, we don't realise how many people of the world we are influencing. In that sense, there are still few artists who can produce these images through the Tibetan concept, the Tibetan viewpoint. So I should even create more! The Buddha, this is what the world sees the Tibetan as. We represent the modern contemporary Buddhist culture now. Buddhist culture means, the image of the Buddha, that you think about, his teachings. So in contemporary artworks, we are trying to put the essence of the Buddha. I'm trying to make the minimalistic form of the Buddha, I'm trying to create a language that the world can read. I can't put, like in thangkas, the mountains, the clouds, and all the hundred offerings -- people get confused. Thangka is really old time, and now we are making the more modern version of Tibetan paintings. So sometimes I'm painting just a few leaves, sometimes a few cloud designs, just specific things. In a way I'm also even teaching the people how the Tibetan thangka paintings are, in details -- in one painting you only see clouds only. In another piece you only see the fire design. So that is in fact being very detailed about our culture. Q. Plus I think, the Buddha in different forms and shapes. A. Yes, yes. Like for example, my sculpture here, this is completely metal, I welded it. And my piece in Chicago -- it's 6 metres, that's like, 15 feet. It sits right in the centre of the city, you cannot imagine, you can't measure the value of it, how you could put it there. So I'm always being very creative how I can get my work there. And then this art piece is hanging next to Anish Kapoor's piece, "The Cloud". You cannot imagine, how did that happen? I think Tibetan people should really study about how the artist works, how their mind works. I'm not trying to praise myself, but I'm talking on behalf of artistic-minded Tibetans, you see: How did I get my sculpture in Grand Park? We have to know, somebody can research, talk to me: How did I get it there? But at the end, when I have Buddha there -- for example, nobody wants to have Buddha or Jesus in the modern city now. So my Buddha is talking about ecological issues, deforestation, like, an area the size of Holland cut down by the Chinese, or in the Amazon all these palm oil production issues are happening. So I made Buddhas with reclaimed woods: To try to show, how to save our nature. In that sense, I'm going to make this sculpture for the Grand Park in Chicago. So then, they really like the idea, and because I have another model made on it -- you see, I already created a model, life size. We have to make these. It's just the work, how much the artist spends his life and energy into it. So once the sculpture is there, it's not talking about Buddha to start with, it's about ecological issues, that I'm trying to be present with my Buddha. And when it sits there, then it starts: "Tibetans". I am there, Tibetan, and then people will read automatically, and then Tibetan issues will come up. Nobody will take me if I make an image of a Tibetan khampa riding on a horse or something, you see? We have to really move forward as to how we will bring the issues in a modern language that people will understand. It has to be artistic: Artistic means, a weapon or tools that will reach the people's mind. Q. The second part of my question was, from all the great painters in the world, the history, who do you appreciate, and really feel amazed in looking at their art, and who would you like to follow, or try to copy? A. So I studied here, in Europe. My favourites are Gaugin -- Paul Gaugin is French, and his colours are amazing. He would paint the water of red colour, and the sky completely yellow, completely opposite, you can't imagine that, completely out of the blue. And van Gogh, who is from Holland. So actually my being in Europe was very helpful to blow my mind, how these guys can paint, can use these colours. When van Gogh is painting the landscape at three o'clock in the afternoon, in Provence, in the south of France, he would catch the timing of the light. These guys are painting the lights and the shadows. You can see these paddy fields, almost like glowing with heat. So it's very deep, those are modern art actually. It's not like somebody says, oh my kids can do that. Classical art, that's different. Like Rembrandt paints, it's very beautifully done. Hyper-realistic. But -- the modern artists, like van Gogh, Gaugin, impressionists. They would just paint the impressions of it, the timings, painting the light, or the meaning of it, more the feelings they would paint. Then in the modern times, some of my artworks are influenced by Roschenberg, the American artist, who also did a great favour to Tibetans, had a show in Lhasa also I heard. I like Andy Warhol also, soup can and all this, very simple things, you can see it through, it's not as easy as hyper-realistic. And then I like Jeff Koons, like Baloon Dog for example, one of the big sculptures that you saw, he did that in Chicago also. So Chicago, where my Buddha is, it's the biggest city in the world for outdoor sculptures. You can see a giant, 5-metre, real Picasso piece, and Miro. So I have my sculpture there, that's really big, for us to have such works there. Not every Tibetan knows about it. But it will come. So I think we should even give more interest and let the young generations know about art. My art is something that moves with the Tibetan people. I'm trying to move the Tibetan mind to their timing. So in that sense you can educate the whole people. I think that's also more important. Sometimes some artists try to make an art piece which makes the viewer more like, not knowing what to do, they can't get it. It takes some time to get it. OK everybody has full rights to do whatever they want. You can make your viewer dumb, or help them right away. So I'm trying to make it that way, like Jeff Koon's piece is very simple, he makes the baloon dog, shining, so simple. Things like that. Q. 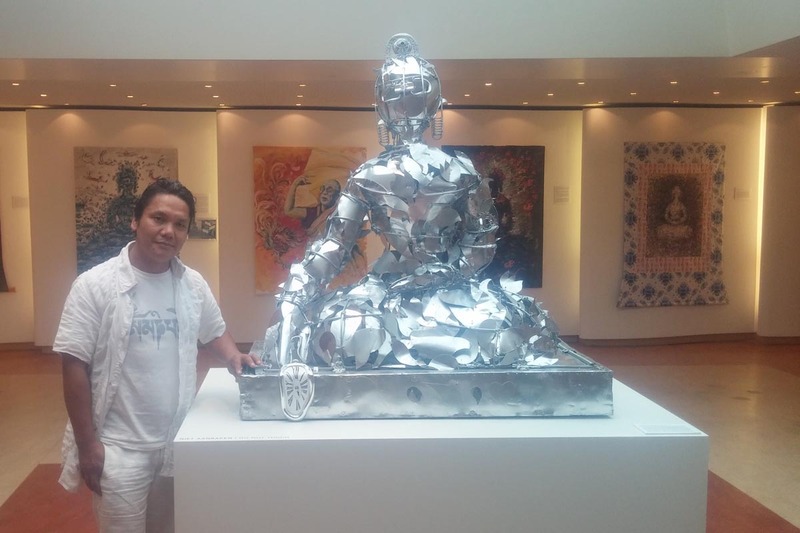 Are you also spending more time, an equal amount of time, in doing installation art, such as the Buddha here, or the other one, with lots of used, scrap material ... do you have plans to do like half that and half painting, or how do you divide your time? A. Exactly, yeah. My sculpture doesn't come because I want it to do ... In Belgium there's a sculpture collective, and a project for the city of Ghent. I spent two years studying about sculpture there. I didn't study that in Norbulingka, only thangka painting. Once you study the sculpture, or ceramic, I've done all these, and you're making paintings ... it comes somewhere in the middle, because you like both the structures, both the materials, so you tend to do both. And I'm very much a free-minded kind of artist, I don't get stuck with one style. For example this Buddha is a smaller version of one I did in Bodh Gaya, in India, which is like 6 metres tall. It's from the Gandhi Museum, in Bodh Gaya, in Patna. So they take care of it now. I want to go there and see how it is. So this is a smaller version of it, with welded iron rods. And Dutch people love this one -- I've been here for like 10 years -- in this sculpture there are tulips, a flower coming out. So this, is a bit of concept that we Tibetans have, I call it "Be the flower, not the bee". So that's what I'm trying to do. With that, I think it's a great message for the world also, it's just the basic fundamentals of Buddhism, be the flower, om mani padme hung. If you be the flower, the bees will come from the distance, crossing the valleys. And likewise the diamond underground -- you find it underground, and even if you find it, you have to shine it so much, to make it a diamond. So, I'm at Emmen, and I thought, ok it's perfect, I just want to paint, and show my work. If it's good, I thought, people will come. And now, we are crossing 5,000 visitors already this month, and we just opened the first of June. So that is like, a big hit you know? I'm very happy about what I'm creating. In the world there are still millions of people who haven't seen the image of Buddha, or the image of the Dalai Lama. A lot of people come who don't even know, especially the young people. So we still have to cross many mountains. Q. So this is my last question. I see lots of people coming to the exhibition, and particularly in the weekends it's full. And you also do painting courses, give workshops, that is also great. That's always packed. So after they come to the exhibition here, to the museum -- when they go, what kind of message do you expect them to go with? A. I think when somebody goes to a museum, and goes out with this amazed kind of expression that they have, I think that's the aim of a museum. And here, I've seen that effect on kids. If that happens, I think it's a success. I have also seen here, people who are completely non-Buddhist, and they feel the energy, that it's very calm, very peaceful, the way Buddha sits. Even to somebody who doesn't know. I remember once, the image of Buddha in New York, the same one I'm showing here. So this black guy, he doesn't know about Buddha, and he says, "Hey, this guy looks very confident." And that's the issues of the black people, they need confidence, that's exactly what they need, because they're treated as slaves. So the guy from that world, he sees Buddha as confident, even though he doesn't know about Buddha. And then another person, they have their own perception of this image of a Buddha. So it's very interesting to see, that everybody sees it differently, but still in its most positive form: He's sitting straight, he's not locked or chained or nailed somewhere. It's a very peaceful image. So that makes it automatically bring peace I think for the viewers.